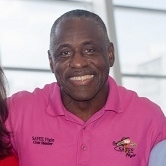 Darrell Robert is the Founder and Director of the SAFEE flight organization. He is the FAA technical director of the Miami International Airport (MIA) air traffic control tower. In this capacity his is responsible for a vast staff in charge of maintaining a myriad of equipment that help keeps the National Airspace System working smoothly. MIA is an international flying hub. The impact of this node has far reaching international implication. Mr. Darrell Roberts was raised in Miami’s Liberty City and earn his degree from Miami Dade College. He is a prime example of what can be achieved by dedicated individuals that call Miami home.